Thirty members of the drill scow JOHN B. 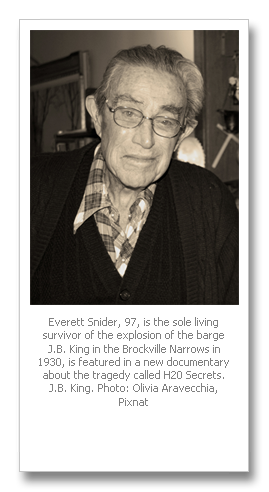 KING of St. Catharines were either instantly killed or blow to death by drowning when a lightning bolt struck the dynamite laden craft three and a half mils up the river at 5.30 o'clock this evening. Eleven of the forty three crew were rescued by a United States Revenue cutter, and one dead body was taken from the wreckage. The tragedy was witnessed by people ashore and by the Captain and crew of the American vessel, whioh was less than half a mile from the ill fated-ship when the lightning struck. Lightning struck the John B. King drillship in the St. Lawrence River, igniting a storage of dynamite onboard. The resulting explosion killed 30 people and injured 11 others. 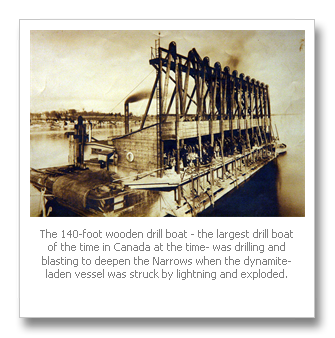 32 lives were lost when this 140' wooden drill barge, which was engaged in drilling and blasting operations, was struck by lightning and exploded on June 26, 1930. There are three big chunks of the wreck. There is scattered debris everywhere (30 feet to 155 feet). The first big chunk is the farthest upstream. It starts between 90 to 100 feet and goes all the way to 155 feet. This piece is part of the hull. Interesting features include steam machinery, an upside down motor boat (@140 feet). There is a hole under the wreckage at the bottom of this piece where you can get 158 feet. If you head out into the channel from the bottom of this first chunk you will find a spectacular sheer wall going straight up. It rises about 25 to 30 feet.